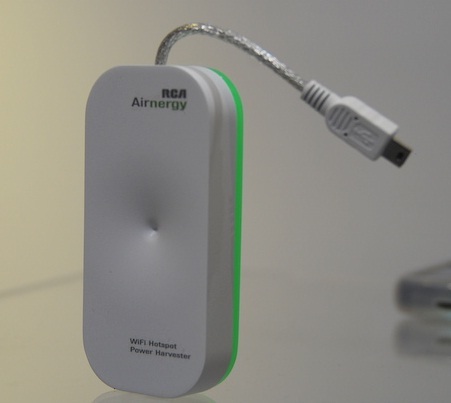 If PowerMats and wireless charging amazed and caught your eye in last year’s CES, the new revolutionary charger technology, Airnergy Wi-Fi Signal Harvester, presented by RCA in this CES is something that might woo you. Measuring smaller than the size of a palm, this tiny Airnergy Charger can harvest surrounding WiFi energy and convert it into electricity for practical use. The energy will be stored in a rechargeable battery located inside it and used to charge electronic gadgets. At the recent CES, RCA demonstrated that Airnergy is able to fully charge a BlackBerry with only 30% power remaining within 90 minutes. Priced at $40, Airnergy is much cheaper compared to the PowerMats charger set. With the increase of Wi-Fi hotspots area nowadays, devices that utilize WiFi harvesting technology such as Airnergy will be another new trend to emerge. Since it uses WiFi source, the device can automatically recharge itself when it is within a WiFi hotspot and save users the hassle of having to search for a charger to charge their devices.